Most Persian food is a cuisine that began in the royal courts and found its way into homes whose kitchens were staffed with cooks. A dish could require hours of prepping and several more of cooking, and then grand platters of jeweled rice, kebabs, and intricate pastries appeared. Those are all represented in “Cooking in Iran: Regional Recipes & Kitchen Secrets,” by Najmieh Batmanglij. But so are ordinary meals that those cooks might have made for their own families, like wheat porridge with lamb and chickpeas, a popular breakfast dish, or osh, a soup of yogurt and chickpeas, sometimes with meatballs, sold at food stands across Iran. Osh is also made with lentils and herbs, barley and fresh stinging nettles, dried fruits and noodles, split peas and bulgur, lamb neck and beans. Najmieh Batmanglij serves up chelow, steamed saffron rice with a golden “tah-dig” crust. * * * Batmanglij, who teaches cooking and lives in Washington, D.C, left her homeland almost four decades ago. For this book, she traveled 10,000 miles inside Iran to cities and tiny villages, from the Caspian Sea in the north, to regions bordering Iraq on the west, Afghanistan on the east, the Persian Gulf in the south. We see the author in a baseball cap tied with a gauzy scarf, pictured throughout. This is Batmanglij’s eighth book (her husband is her publisher). It’s mammoth, the size of an encyclopedia volume, divided into geographic areas, with maps, and begins in Tehran, her home city, where she brings roses to her parents’ burial site. She traveled with a driver and photographer, who shot ordinary people cooking in their environment and working — picking tea leaves (tea became popular during the Russian occupation of Northern Iran in the early 19th century), saffron, pistachios, and more. 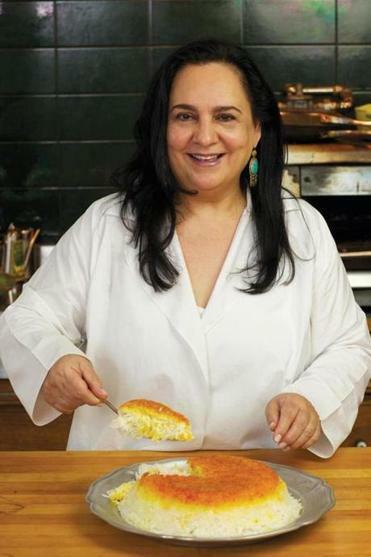 She offers historical sketches of each region, along with explanations of dishes sometimes found in neighboring countries, like the small deep-fried pies called pirashki (a variation of Russian pirozhki), and nan, and biryani (adaptations are made in India). We see a food bazaar in Iranian Azarbaijan with intricate pointed brick archways, metal platters piled high with pointed, identical mounds of colorful foods that seem painted rather than placed by hand, and a cafe where older men are smoking hookahs across from their younger counterparts looking at their cellphones. The author writes about Iranian Jews, who, she says, “have been so intertwined with Persian culture for so long that little difference is seen in their food — except perhaps that, to be kosher, butter is not mixed with meat.” Iranian Kurds in the west, along the Zagros Mountains, prepare appealing rustic dishes, stuffing large onions with rice and herbs, simmering white beans with heaps of chives, and adding barberries to lamb stew, bulgur and lamb meatballs, and rice with mushrooms. Iranian Armenians, writes Batmanglij, were pioneers in the arts. In the Persian Gulf, the various cultures within Iran — Persians, Arabs, Baluchis, Kurds, East Africans, Armenians, and Jews live together and have intermarried over the centuries, she says. You’ll find grilled whole fish, fish-head soup, date buns, flatbreads baked on ashes (and the many other flatbreads in the cuisine), rice with lamb and rose petals, minced lamb kebabs, dried balls of a yogurt-like mixture called kashk, date halva, rice in every way, including in the national favorite, chelow, steamed saffron rice with a golden “tah-dig” crust. I made chelow with tah-dig for the first time and though the dish had too much olive oil (the grains might have better absorbed the alternate fat ghee), the rice and its crust were spectacular. I also cooked eggs in pureed eggplant, a dish from the Caspian region, charring the eggplants directly on a gas burner, which turned this striking dish mildly smoky. You will learn about Iran and its people here, and you’ll be stunned by their food. To read the book is to be immersed in another culture, region by region. It took Batmanglij five years to accomplish it all and every bit of labor shows.